The excitement of being able to do something with her hand independently after fifteen years is so huge for Kathleen and for me. 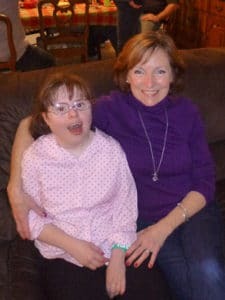 My daughter Kathleen was born with Down syndrome. At five years old, she was diagnosed with a very rare neurovascular disease called Moyamoya that caused a series of strokes. After the strokes, Kathleen spent a month in a rehabilitation hospital; she regained her language and ability to walk over the course of the next year, but not her ability to use her left hand. A year later her physical therapist told us not to expect any additional improvements in her ability to use the left hand. Kathleen is now nineteen years old and still had not regained any hand function, until recently when we got her a SaeboGlove. As soon as we put it on her tiny hand, she was beaming. Suddenly, she could open her hand and pick up blocks! Formerly she couldn’t pick up a single block or even open her hand at all. She, her therapists, and I were all so excited, saying, “Let’s try this! Let’s try that!” For the first time since she was a toddler, she was doing things with her hands without my help. She was able to hold a piece of paper in her left hand and cut with her right hand. After forty minutes, I asked Kathleen if she wanted to take the SaeboGlove off and she said no, she didn’t want to take it off. Usually, she would tire of any therapy after about twenty minutes, but she loves wearing the SaeboGlove. She is so eager to use it every day and she LOVES showing other people how it works. The excitement of being able to do something with her hand independently after fifteen years is so huge for Kathleen and for me. Now I can dream of her becoming more independent, being able to dress herself, put on her own jacket. There are so many things that require two hands – even just being able to open her hand flat so she can lean on it is an important gateway to new activities. It used to take so much work just to get her hand open and now she can do it on her own, attend cognitively to everything involved in that movement, and emotionally feel the joy of her accomplishment. I can see the new connections developing in her brain already. Next Kathleen wants to learn how to play the drums. I will gladly listen to her practice all day long. We celebrate these new accomplishments with her. Kathleen never gives up. She is truly my hero!